Congratulations to Jose-Luis Velador, Event No. 33 Champion ($260,517)! 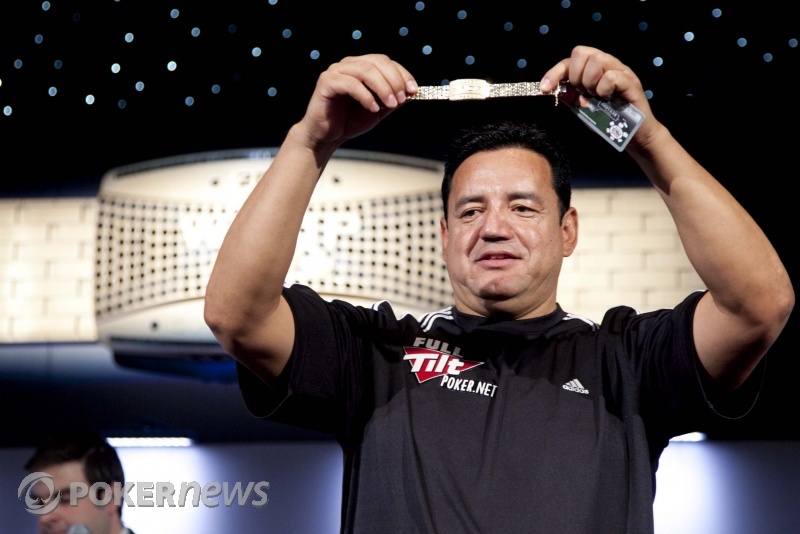 Two years ago in 2008, Jose-Luis Velador claimed his first World Series of Poker gold bracelet when he won a $1,500 No-Limit Hold'em event for nearly $575,000. A few minutes before midnight tonight here in Las Vegas, Velador claimed his second piece of gold jewelry from the WSOP after he defeated David Chiu heads up. Velador came into the third and final day as the chip leader, slightly edging out Chiu who sat in second place at the start of the day. When it got down to just two players left, it was the two who began at the top to begin with. 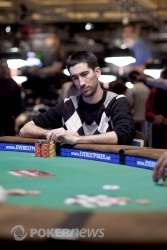 Velador's amazing run began a couple hours into the day when he eliminated the biggest threat in Phil Ivey. From there, you just couldn't stop the Velador train. He eliminated player after player en route to victory, making for a rather short final table for what we're used to. Finishing on top of the 482-player field earned Velador a payday of $260,517 while further cementing his spot in poker history as one of the select few to capture multiple gold bracelets. Congratulations to Velador for taking home the gold and walking away as champion of Event No. 33! As for us at PokerNews, we're not quite done yet. We've got plenty of World Series coverage going on so be sure to follow along. Thanks for following our coverage here. 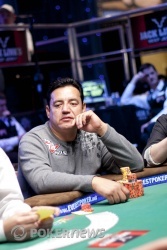 Jose-Luis Velador had the button and made a raise before David Chiu reraised from the big blind 124,000 more. The initial raise amount was unknown. Velador made the call and off to a flop they went. The flop came down and Chiu fired 372,000 into the middle. That was more than half of his stack and when Velador reraised the pot to put Chiu all in, Chiu made the call. Velador held the for top pair and Chiu held the for two live overcards. The turn was the and was close, but not what Chiu needed. He still needed an ace or a ten on the river, but couldn't find it when the fell on the river. Velador had Chiu well covered and that was it. Chiu and Velador shook hands before Chiu took the gold bracelet out of its holding case and put it around Velador's wrist for a very nice gesture. Chiu walked away with over $160,000 for his finish. From the button, David Chiu raised to 64,000 and Jose-Luis Velador made the call from the big blind. The flop came down and Velador checked. Chiu fired 80,000 and then Velador raised the pot. Chiu moved all in quickly and Velador called the little bit more it was to him. Velador held the and Chiu the . Chiu's top pair was good on the flop when the money went in and it held up as the turn ( ) and river ( ) came out. 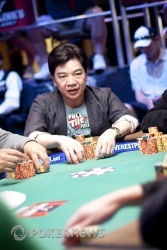 Chiu doubled to about 950,000 in chips. Velador still has over 2.6 million. Rob Hollink limped the button before Jose-Luis Velador raised to 80,000 from the small blind. David Chiu gave it some thought in the big blind and then mucked before Hollink committed the call. The flop came down and the two players quickly got the money in the middle. Hollink held the for top two pair. Velador held the for an overpair of kings. The turn was the and then the river the , counterfeiting the two pair for Hollink and sending him out of the tournament as Velador earned another elimination. He's now heads up with Hollink. Rob Hollink completed from the small blind and then Jose-Luis Velador raised from the big blind to 60,000. Hollink made the call. The flop came down and Hollink check-called a bet of 100,000 from Velador. After the fell on the turn, both players checked. The fell on the river and Hollink fired 175,000. Velador called. Velador showed the for a full house, sevens full of aces and beat Hollink who flashed two kings before mucking. Jose-Luis Velador and Craig Gray put 120,000 chips in preflop each before the flop came down . Gray pushed the last of his stack in on the flop and Velador quickly called. Gray held the and was up against the for Velador. After the dealer placed the on the turn, Gray was drawing dead versus Velador's kings full. The river completed the board with the to officially end things. 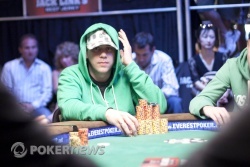 Gray finished in fourth place and took home over $85,000 for his finish, his largest score to date. On the button, Kevin MacPhee raised to 60,000. His only customer was Jose-Luis Velador in the big blind. The flop came down and action was checked by Velador to MacPhee. He fired a continuation bet worth 80,000 and then Velador raised to 200,000. MacPhee moved all in for about 500,000 total and after a minute in the tank, Velador made the call. Velador held top pair with the and was ahead against MacPhee's . The turn was the and the river the to keep Velador's pair of kings the best hand. 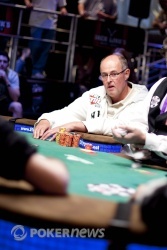 He eliminated MacPhee in the hand and boomed his way up to over a 1.5 million in chips.